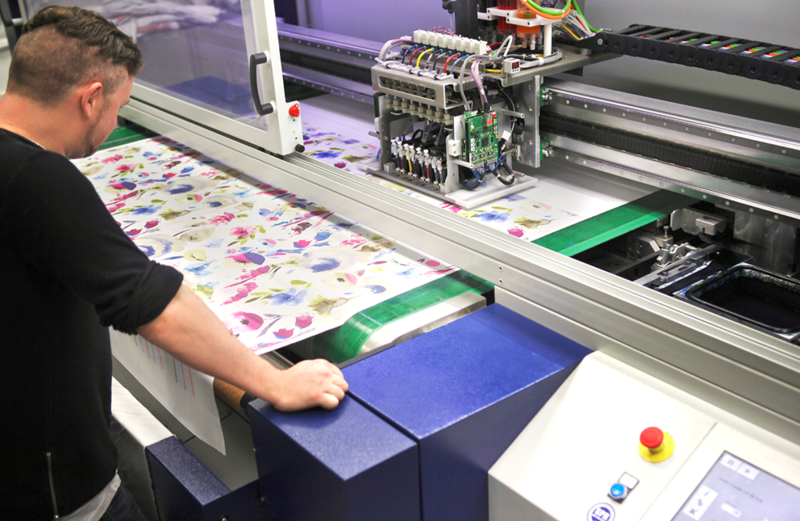 Here at the Haddow Group we offer the very latest technology in Industrial Digital Fabric Printing for textiles. Offering speed and flexibility for all your textile digital printing needs. We offer a reputable and reliable drop shipping service with a fast turn-around, high quality and fast shipping service. We in return, manufacture, quality control check and ship the product to your customer on behalf of your company. The biggest benefit to dropshipping is the ability to offer a large selection of product without purchasing inventory upfront and managing that inventory. Dropshipping can also be a great tool to help diversify your inventory and test products since it’s just a matter of adding the new product to your store. Our industrial inkjet pigment water based wide format printer delivers the very latest technology and it delivers excellent results in a very eco friendly manner. LEAD TIMES – Our lead times are very short typically 4-10 days as the digital printer offers such flexibility. FLEXIBILITY – As we are so flexible we can also combine many designs and colourways on a single print run. MACTHING – We can colour match anything. SHORT RUNS – As we have such a short period of set up and turnaround we can offer shorter print runs. FORMATS – PSD, PDF and TIFF files but we will discuss any others with you. DPI – We can work with 150 DPI artwork files but we are flexible to your needs.